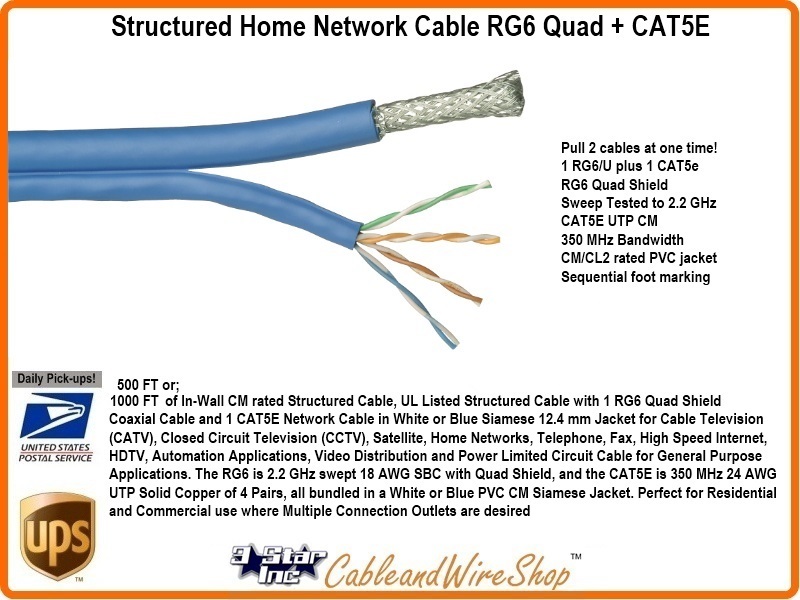 In-Wall CM rated Structured Cable, UL Listed Structured Cable with 1 RG6 Quad Shield Coaxial Cable and 1 Cat5e Network Cable in Blue or Orange Siamese 12.4 mm Jacket for Cable Television (CATV), Closed Circuit Television (CCTV), Satellite, Home Networks, Telephone, Fax, High Speed Internet, HDTV, Automation Applications, Video Distribution and Power Limited Circuit Cable for General Purpose Applications. The RG6 is 2.2 GHz swept 18 AWG SBC withQuad Shield, and the Cat5e is 350 MHz 24AWG UTP Solid Copper of 4 Pairs, all bundled in a White or Blue PVC CM Siamese Jacket. Perfect for Residential and Commercial use where Multiple Connection Outlets are desired. Note: SuperShield (Quad Shield) - Taking the Tri-Shield construction one step further, this construction adds an additional layer of shielding braid to provide the greatest strength, durability and immunity from network interference. Provides low attenuation for service drop inteconnecting jumper cables. Cat5e cable is still limited to a maximum of 328 ft (100 m) in length that should include the length of patch cables that interconnect equipment. Cat 5e cable performance characteristics and test methods are defined in TIA/EIA-568-B.2-2001. Cat5e solid conductors are for distribution (typically) whereas Stranded conductors are usually reserved for flexible needs such as patch cords and cables. AWG conductor sizing is typically 24, comes in pairs of 4, and UTP (Unshielded Twisted Pair). When using LAN (Local Area Network) cable such as this is used in areas of likely ambient interference that would slow performance from the 350 MHz bandwidth and degrade 100 Mbps (100BASE-TX) potential performance, then SHIELDED Cable is recommended and you would then look for the STP moniker that indicates Shilded Twisted Pair.. If the cable is run near or in Air handling spaces, then you should check the local building codes pertaining to Plenum cable use as each jurisdiction can be different in definition and guidance. Riser rating is something recommended as a minimum for all interior (in wall) use. CM is for exposed runs and CMX is exteriror rating, though not necessarily UV ray resistant to degradation. CMXT and CMXT are discriptor examples that intonate exterior (X) and flooded (F) or Taped (T) for Underground Use (Direct Burial).